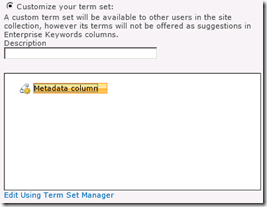 It is possible to receive the following error while creating a Managed Metadata column for your SharePoint 2010 and SharePoint 2013 site. 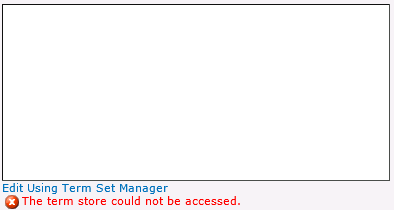 The term store could not be accessed. Microsoft mentions the below configuration on http://technet.microsoft.com/en-us/library/ee530391(v=office.14).aspx at ‘Update a managed metadata service connection’. 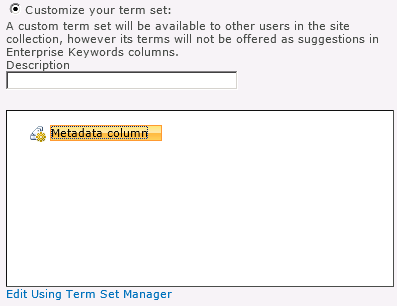 It is now possible to select a Managed Metadata Column and create a custom term set. Thanks for this fix – worked for me perfectly! Resolved my issue where I had created a Managed Metadata column with a term set but was unable to change the column from displaying the entire path, to just the term label, where I was getting the error saying that the Term Store could not be accessed.